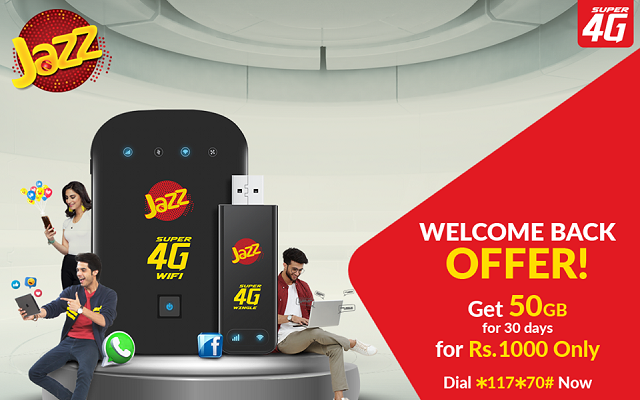 Jazz has introduced a new welcome back offer for its 4G Wifi Device users. If you have not used your Jazz Super 4G Wifi Device for three months, you can avail this offer. Reconnect Your Jazz Super 4G Wifi Device and Get 50GB in Just Rs. 1000. The validity of the incentive is just 30 days. The interesting thing about this offer is that all Jazz customers can avail this offer multiple times during 90 days. Offer availing customer can check usage by dialing *6363# and going to option 4. 6363 Menu is accessible from Device & Jazz Prepaid SIM. Offer usage threshold notifications will be sent to MBB nos. and OCN (all OMOs). All dormant customers can subscribe to this offer if they have not used Dongle sim from last 3 months or more. The customer can check eligibility by dialing *6363# and going to option 4; welcome back offers subscription details will be displayed only to eligible customers. Welcome Back Offer is a once-off, and will not recur automatically. Subscription from the customer would be required to avail this offer again.